We had a strong storm in these days, but today it was a beautiful day in Shirahama. 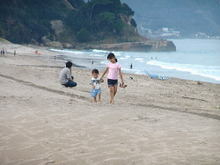 After cleanning up the kitchen we went to Shirahama beach with my son, "Yuuki" and my daughter, "Hikari". This entry was posted in beach, Family on 2006年9月28日 by izusakuraya. 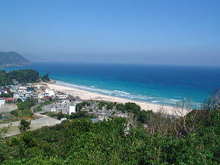 Last weekend it was cloudy and we had strong wind in Shimoda, but it was very beautiful day today. I took this picture from the top of mountain behind Pension Sakuraya. We can see Amagi mountain, Inatori cape and Izu seven island from here. The white sand and blue sea are excellent ….. . 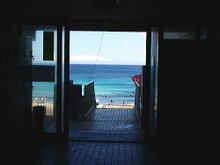 This entry was posted in beach on 2006年9月20日 by izusakuraya. Over that tunnel there is a paradise !! Today it was more beautiful day than yesterday !! From this morning my children were very excited, because they could go to the beach today too. My son, Yuuki went to the bed too late last night, so he was not fine this morning. But I said, "Let’s go to the beach !!" He became be really excited soon and went to the beach holding his hands with his grand father. As I had a job this morning I went after my job was finished. During summer we go to the beach through the buiding of "Resupo Shirahama". This morning I could see the beautiful scenery over this buiding. …. This entry was posted in beach on 2006年9月10日 by izusakuraya. On the beach with grand’pa and grand’ma ! Today my parents came to Shimoda from Miyazaki Pref. in Kyushu by airplane and train to meet their grand children. So we, my children, parents and me went to the beach for swimming together. As usual my son was not scared the sea and wanted to go into the water with his grand father. 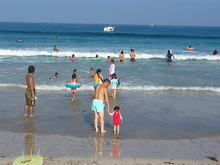 This entry was posted in beach, Family on 2006年9月9日 by izusakuraya.